In the last decade, land price in Beirut increased by more than five fold. 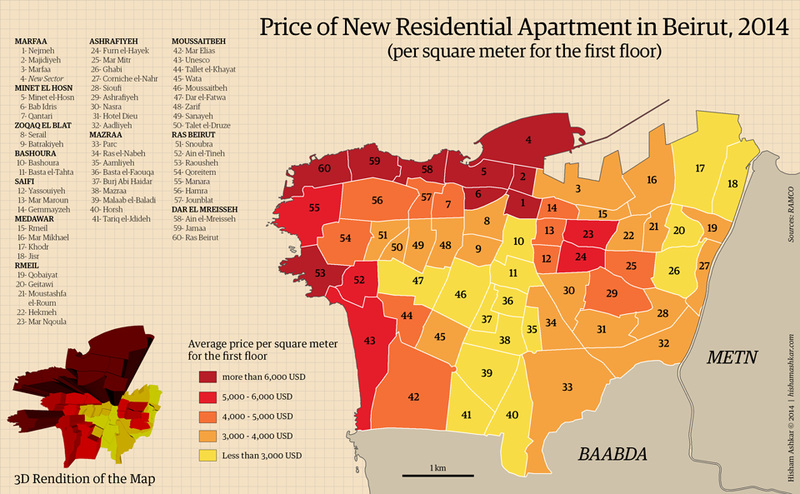 This price hike is pushing Beirut up the ladder of the most expansive places to live in. Recently, its Downtown ranked the 24th most expensive in the world for office space. This map shows the average starting price of newly-built residential apartment in 2013-2014. The price is per square meter, and for the first floor. In the newly constructed upscale buildings in Beirut, the price of apartments increases by at least US$100 per m² per floor. If we take, for example, the case of Trabaud 1804 in Furn el-Hayek, the starting price in 2011 for the first floor was US$ 5,000 per m², and it reached US$ 8,500 for the 23rd floor. For comparison purpose, the minimum wage in Lebanon is US$ 450 per month. The map is an adjustment by sector for the map released by RAMCO in March 2014.